i am tickled to pieces to have found these woolly eggs in your homes! and a perfect trio by andrea! i love how this yarn makes them look like they are speckled! ours are currently upon the nature table - except when they are stuffed under the couch. (does anyone else's child like to hide treasures there?) i loved seeing all the nature tables at the rhythm of the home blog! erin shared a beautiful table from her children's school too. and i would love to see more! woolly eggs + nature tables both! please consider sharing yours on the flickr group, or let me know if you have seen any others around the interwebs! 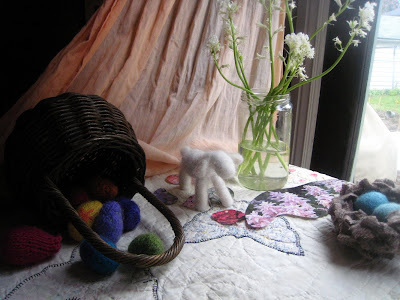 edited to add: just saw suzanne's woolly eggs here, and found them on her blog here and here! aren't they fantastic?